Ever since I was a little girl, my mom has taught me to be kind to all people whether they were worthy or not. While growing up, I realized that being merciful is not just a cultural concept but also religious. In school, I learnt that different religions encourage people to show mercy to other people and animals. Also, I read how it helps in building strong relationships with people, hence building peaceful societies. However, this was not the only reason that encouraged me to relate peace to mercy. Being exposed to what is happening in the Arab world today, especially in Syria, hurts me and provokes me to act, to save the helpless, and to restore peace. What actually breaks my heart is the scared looks on the children's faces in war zones. Fortunately, I was given the chance to fight violence with peaceful art. Therefore, I chose to represent the relationship between Islam and Peace through Mercy. Abu Hurairah (May Allah be pleased with him) reported: The Prophet (ﷺ) kissed his grandson Hasan bin 'Ali in the presence of Aqra' bin Habis. Thereupon Aqra' remarked: "I have ten children, and I have never kissed any one of them." The Messenger of Allah (ﷺ) cast a glance upon him and said, "He who does not show mercy to others, will not be shown mercy." Both hadiths relate God's mercy on us in this world and the Hereafter to our mercy to humankind and animals. This shows that Islam strongly calls us to Be Merciful unlike what people think. In many courses, I had to listen to people claiming that Islam spread by force which contradicts its message 'Al salam' although history tells us that Abu Bakr specifically told Yazid ibn Abi-Sufian “I give you ten commandments: don’t kill a woman, or a child, or an old person, and don’t cut trees, or ruin dwellings, or slay a sheep but for food. Don't burn palm trees, or drown them. And don’t be spiteful or unjust.” All of this proves that Islam calls for peace and mercy. The choice of calligraphy was based on my attempt to perfect my soul since "calligraphy is the geometry of the spirit". Also through the course, I associated calligraphy with religious productions, especially the Quran, which inspired me to further associate calligraphy with Hadith. However, whoever knows the rules of calligraphy, knows that I broke those rules. All I wanted was to produce something different that demonstrates my message and provokes people's interest. I thought I can link the limitless application of calligraphy with the endless applications of mercy. My work was inspired by the ideas and artworks of Bihnam al-Agzeer. He is an Iraqi Christian calligrapher who uses his art to promote peace between Muslims and Christians. He and his family were forced to leave Mosul because of the accelerated violence towards the Christian community in Iraq. Despite losing his home, he worked on creating peaceful art to bring the Iraqi community, Muslims and Christians, together. I was inspired to choose a concept that is taught in Islam and Christianity to promote peace and co-existence. So, I designed my sentence and ensured its vertical symmetry. Then, I applied tape over it because I want the message of mercy to be pure (white). Later, I used a sponge to create a special effect by the colors (blue & green) indicating heaven and its rivers. Once the colors dried up, I removed the tape and outlined the words with blue and green glitter. I am, Fatima Hmeicho, a senior business student majoring in Accounting, Economics, and Finance and graduating in May 2016. I was born in Syria where I received most of my education. I moved to Dubai in 2012 with my family to follow my dreams of being an outstanding business women. Course material. 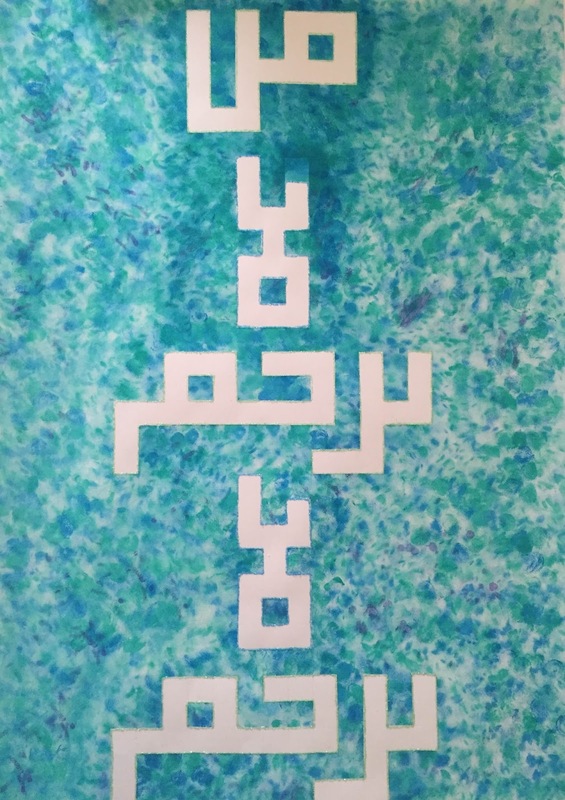 Islam and calligraphy.